Because St. Kyranna was martyred during the time of Turkish occupation, the only thing that was known about the location of her relics was that they were buried “outside the walls” of Thessaloniki. 260 years later St. Kyranna allowed the location of her relics to be discovered to the people who have honored her memory all this time. 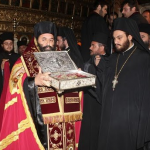 This all began when Metropolitan John of Lagada inaugurated 2011 as the year of Saint Kyranna, and he began to research her life in various sources. 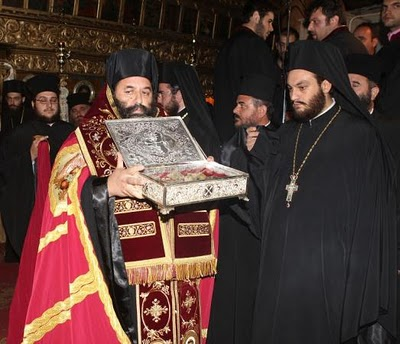 Thus on 12 September 2011, with the help of a monk from Mount Athos and the assistance of specialists and forensic experts, they confirmed that in the Holy Altar of the Church of the Archangels in Ossa, where St. Kyranna herself attended the Divine Liturgy, beneath the floor slabs a large portion of her relics were discovered.